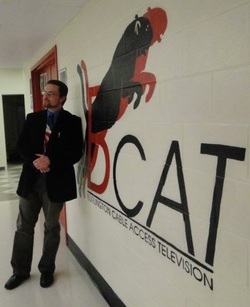 Burlington Cable Access Television is located around the back of Burlington High School. Driving at a comfortable speed down I95/128 take Exit 33B onto 3A/Cambridge Street. From here, take a left into the high school. BCAT is around the back of the building. If these directions didn't help whatsoever, type in 123 Cambridge Street. Burlington MA, 01803 to your Global Positioning System, also known as a GPS.